This interesting name has two quite distinct possible origins. 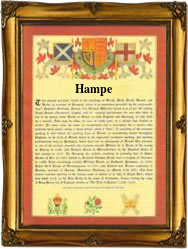 Firstly, it may be of Anglo-Saxon origin, and a locational surname deriving from the place called Hamp in Somerset. The placename is recorded in the Domesday Book of 1066 as "Hame", and is named from the Olde English pre 7th Century element "ham(m)", meadow, flat low-lying meadow on a stream. In some cases the surname Hamp may also be topographical, rom residence by such a water-meadow. Secondly, the name may be of Old German origin, from the medieval given name "Hampo", which is a short form of the compound name found as "Hamprecht", in Middle High German. This was a development of the Old High German form "Hagenberht", composed of the elements "hagano", hawthorn, with "berht", bright, famous. The personal name enjoyed considerable popularity in Europe during the Middle Ages, judging by the number and variety of surnames deriving from it; these range from Hamp(e) and Hemp(e) to Hamprecht, Hemprecht and Hemprich. The surname from this source was introduced into England during the 16th Century. Among the recordings of the name in German Church Registers is that of the marriage of Johan Hamp and Catharina Riechart at Grossheppach, Neckarkreis, Wuertt, on June 22nd 1586. In London, John Hamp married Elleoner Roberts at St. Giles', Cripplegate, on July 24th 1640. The first recorded spelling of the family name is shown to be that of Michaell Hamp, which was dated March 6th 1579, witness as the christening of his son, Robert, at St. Dunstan's, Stepney, London, during the reign of Queen Elizabeth 1, known as "Good Queen Bess", 1558 - 1603. Surnames became necessary when governments introduced personal taxation. In England this was known as Poll Tax. Throughout the centuries, surnames in every country have continued to "develop" often leading to astonishing variants of the original spelling.